One of 74 stunning tropical islands that make up the Whitsunday group of islands on the Great Barrier Reef off the Queensland coast, Hamilton Island is the ideal holiday destination to relax and get away from it all. Renowned for its stunning natural environment and situated in one of the world's most amazing marine parks, Hamilton Island is not just the place to unwind, it also offers a fantastic range of activities to enjoy. Hamilton Island is home to some of the most glorious natural tropical landscapes and attractions including the Great Barrier Reef, coral fringed beaches, the iconic pristine Whitehaven Beach and so much more. However the island doesn't sacrifice on quality or the modern comforts and there are still an excellent range of accommodation and facilities to enjoy. Accommodation on Hamilton Island is designed to appeal to all tastes and budgets offering everything from rustic private Palm Bungalows to deluxe suites at the Beach Club, self-contained holiday homes and apartments to Luxury Villas. The island is a popular destination for couples and honeymooners however it is also a rather family friendly holiday destination with kids welcomed onto the island. The Reef View Hotel on Hamilton Island has over 350 spacious rooms and suites with the top two floors having some of the best ocean views on Hamilton Island. Your home away from home, the spacious accommodation of the Whitsunday Apartments offers self-catering facilities such as full size kitchens as well as the convenience of hotel amenities. Close to all the necessities on Hamilton Island, Palm Bungalows offers affordable free standing accommodation with balconies overlooking tropical gardens. 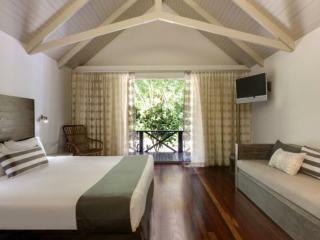 Hamilton Island Holiday Homes are scattered around the island in a variety of sizes. For those seeking self contained accommodation ranging from standard to luxury and premium budgets. There are a number of kids clubs and activities programs in place to provide safe and supervised fun with arts and crafts, games, visits to beaches, fishing and more. There's also plenty for the whole family to enjoy including go karting, an 18-hole championship golf course, a variety of water sports, tours and the renowned Wild Life Hamilton Island experience where guests have the chance to get up close and personal with a range of wildlife including koalas, kangaroos, wombats and even crocodiles. Hamilton Island is also home to six nightclubs and bars, ten restaurants and a variety of boutique stores and shopping facilities in a relaxed yet stylish cosmopolitan atmosphere. 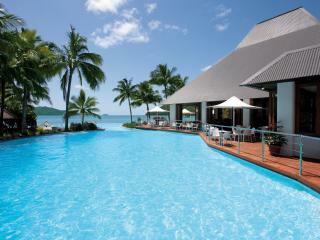 It's this stylish yet relaxed, picturesque atmosphere that also makes Hamilton Island so popular for weddings. 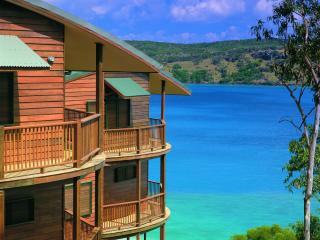 Offering the best of both worlds, Hamilton Island allows you to do as much or as little as you like. There are cruises to the Great Barrier Reef or try one of the 60+ activities available. Go diving in the crystal waters, explore the shopping and dining of the marina, laze in the shade of a palm tree or work on your tan on stunning Whitehaven Beach. The choices are practically endless. If you're lucky enough to be visiting during Race Week, there'll also be plenty of opportunities to party.